Athlete's foot is an unpleasant disease that can complicate our lives. In addition to unpleasant itching, it also causes a strong foot odour. Have you experienced the feeling of shame after taking off your shoes? Athlete's Foot is caused by sweating, inferior footwear, poor diet or hygiene. Fortunately, our ancestors have shown us the solution through the power of herbs, nature's gifts. We offer natural products that help reduce foot odour and ease the itching as well as other accompanying symptoms. Utilising natural botanical extracts, HillVital has combined the most effective herbs to tackle Athlete's Foot. Get rid of foot mycosis, odour and cracked skin naturally. NATURAL ANTIFUNGAL CREAM, REMOVES FOOT ODOR AND RELIEVES ITCHING Our antifungal cream is ..
Antifungal balsam for Athlete’s foot. A unique combination of 14 medicinal herbs for foot mycosis, odour, and cracked heels. Balsam supports, soothes, softens, and helps heal cracked and dry skin. Marigold Soap for healing wounds, skin diseases, and itching. 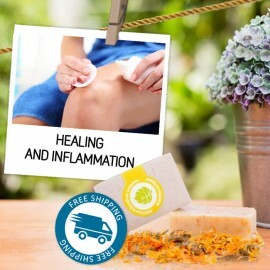 Marigold is useful in treatin..
Marigold soap reduces inflammation, swelling and reddening of the skin. Our soap helps heal wounds as it gently softens, calms and hydrates the skin. 100% natural without added perfumes or parabens.